4.Do not contact with open fires or near a heating source. NOTE: Please pay attention to size info before purchasing. 100% food grade silicone mold, pass FDA/LFGB/SGS. Non-stick, stripping easy, easy to clean, environmentally friendly, low-carbon, can be recycled, Safe, non-toxic, odorless, heat evenly. Not easy to damage, no crack, resistance to extreme temperature,-40°C-230°C(-40°F-446°F). Safe to use in ovens, microwave ovens, dishwashers and refrigerators. 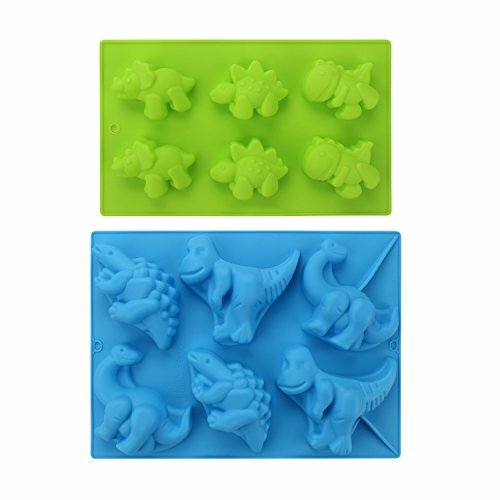 Beasea silicone dinosaur molds are great for all sorts of cooking and craft activities - making hard candy, chocolate, gum paste, gummies,cookies, ice cubes,mini soaps,cupcake, christmas cake decorations and so much more. Mold Dimension-2pcs silicone dinosaur molds: 11.3"x8.4",10.9"x6.6". Please pay attention to the product size before placing an order. If you have any questions about this product by Beasea, contact us by completing and submitting the form below. If you are looking for a specif part number, please include it with your message.